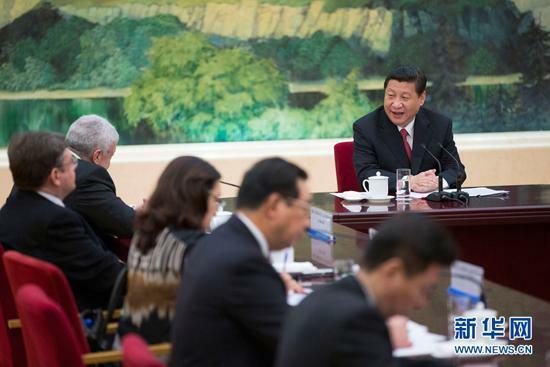 The closest anyone came to asking a tough/interesting question was when the Brazilian journalist asked for personal information about Xi’s experiences governing China: “How many time can you spend with your family? Can you introduce to us your personal experience and hobbies” the reporter asked. Xi Jinping did say one interesting thing though, which Fish noted in his piece, and also flagged by Time’s Austin Ramzy. In fact, everyone will be talking about it, because it’s the only interesting thing Xi Jinping said. I have many hobbies. I love reading most. Reading has become a way of life for me. I am also a sports fan. I like swimming and mountain climbing. I liked football and volleyball when I was young. I wish to congratulate Brazil on hosting the World Cup again. Unpredictability is what makes a sport match, especially a football match exciting. During the last World Cup, we had Paul the Octopus. I wonder if next year, there will be another octopus who can predict match results. The Brazilian team has the home-court advantage and I wish them good luck. Maybe the New York Times, et al. aren’t too sad to have lost their invitation to this presser. Honestly, his words are genuine. He doesn’t say something if he thinks he can’t do in reality. Politicians nowadays like to give sweet talk and amaze people but in the end, nothing is done really. What’s the whole point ? I read the transcripts from the interview. It strikes the heart. Genuine, objective, straight and you can sense that his words are his bonds. I think they will have a good 10 years ahead.